After Liverpool’s lackluster display against Southampton, many people were disappointed with the lack of creativity and flair in the Liverpool midfield, calling out for new signings and the departure of Jordan Henderson and Lucas Leiva. These fans were desperate for the return of Luis Suarez, hoping that his partnership with Daniel Sturridge will propel Liverpool into better form and an eventual Champions League spot at the end of the season. However, it is not Luis Suarez that is the vital cog within the Liverpool attack, it is their tricky Brazilian wonderkid Coutinho who will do so. 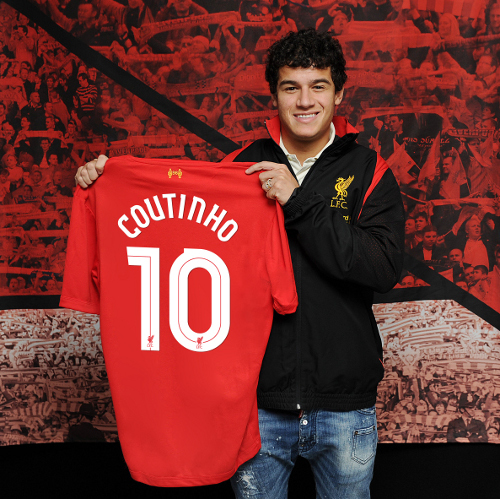 Signed from Inter Milan in January 2013 for a measly fee of £8.5m ($13.8m) after a disappointing spell where he could not live up to his potential, Coutinho has found a home at Anfield. Ever since his debut at Liverpool, he has instantly become a fan favorite with his mazy dribbling skills and sublime passing ability. Anyone who has watched Coutinho play knows that he is capable of threading a pass through the smallest of openings and capable of creating chances out of nowhere. As the cliché goes, Coutinho is capable of splitting a defense open like a hot knife through butter. It is a skill that Liverpool fans have missed dearly ever since the departure of Spanish star Xabi Alonso. Coutinho has proven to be a revelation and a bargain. Before being sidelined for almost two months by a nasty shoulder injury due to a clash with Ashley Williams, Coutinho has been the driving force behind Liverpool’s improving attack. In only 923 minutes of Premier League football in the 2012/13 season since his debut in February against West Brom, Coutinho already has three goals and seven assists; he was directly involved in a goal once every 92 minutes, so basically once a game. A more recent example of the importance of Coutinho was in the Swansea game where he was taken off in the 55th minutes. Liverpool completed 48 successful passes in the final third in the first half, and only managed a measly four after the break. We can take a look at Coutinho’s numbers in comparison to other midfielders in the Premier League last season just to measure the true impact of Coutinho. First we take a look at Santiago Cazorla, Arsenal’s diminutive Spaniard. In 3301 minutes of Premier League football, he was directly involved in 25 goals, averaging one involvement every 132 minutes. Or Juan Mata perhaps, one of the best players in the Premier League last season. He was involved in 29 goals in just 2729 minutes, however, he was still not as impactful as Coutinho, his involvement was only once per 94 minutes. Another Spaniard whose creativity has been praised is David Silva, yet his involvement was far worse than that of Coutinho. He was involved in only 16 goals last season in 2511 minutes of football, averaging an assist or goal once every 157 minutes. In comparison to the other top attacking midfielders in the Premier League last season, albeit in a smaller sample size, Coutinho has proven to be an elite attacking midfielder who was directly involved in goals and assists at a higher rate than any other elite attacking midfielder. Coutinho’s impact at Liverpool measured statistically has been leaps and bounds over any other player in the team, and Liverpool can only hope that his injury is not too severe. The return of Coutinho, combined with the form that both Luis Suarez and Daniel Sturridge are in, is a very promising sign for Liverpool this season. Daniel Sturridge has been performing at a really high level as well. Thanks for reading our article! Next Next post: Roger Federer: Does he have anything left?